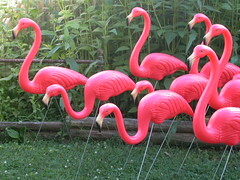 Welcome to GetFlocked.com - Home of the Original "Don Featherstone" designed pink plastic lawn flamingos. Still proudly made in the USA! We are no longer stocking flamingos but you can purchase them here (Amazon): Original Featherstone Flamingos, Pack of Two . Also available are the fabulous larger versions (also designed by Don Featherstone) called Realmingos (Realmingo Standing , Realmingo Feeding ) and the special spooky Zombie Flamingos . See the right side bar --> for images and links for all of these flamingos! The classic flamingos are the Genuine "Don Featherstone" design (with his signature), created in 1957 by Union Products in Leominster, Massachusetts. Union Products closed in 2006, but the original molds for these classic pink 1950s icons were purchased and are still being used to produce them today. These flamingos come in pairs - one with its head up and the other with its neck curved downward. They are bright pink full detail fade resistant molded plastic with raised plastic eyes and painted beak. 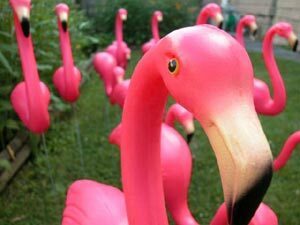 Flamingo Flocking is a great fundraiser for your church, group, or organization. By the pair or by the flock... Flamingos are just fun. Are you looking to replace the legs on your flamingos? We do offer replacement legs for our "Don Featherstone" designed flamingos! Technical Specs: The pair consists of one flamingo with it's head up (stands about 34 inches high including legs, flamingo size is approximately 13" long x 5" high at body x 14" high at neck/head x 4" thick on body) and one flamingo with it's neck curved downward (stands about 24 inches high including legs, 17 1/2" long x 5" high at body x 8" high at head/neck x 4" thick on body). The legs are non rusting metal and are 21 1/2" long. International Orders Welcome! Order Now! See our Policies page for more information about ordering from us, including shipping rates to Australia, New Zealand and United Kingdom.